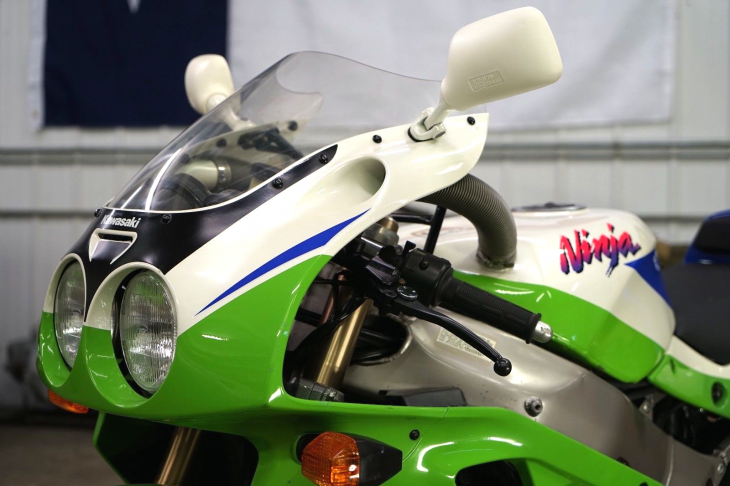 The ZX-7R was Kawasaki's entry into the hotly-contested 750cc superbike class in racing and on the street, their answer to the Suzuki GSX-R750, Yamaha's YZF-750R, and Honda's RC30. At the time, the 750cc inline four was the go-to configuration in World Superbike competition, unless you were Ducati. Of course, each manufacturer built limited-production homologation specials to help create the very best foundation for their World Superbike entries, except for Honda, whose RC30 was basically an homologation special to begin with. 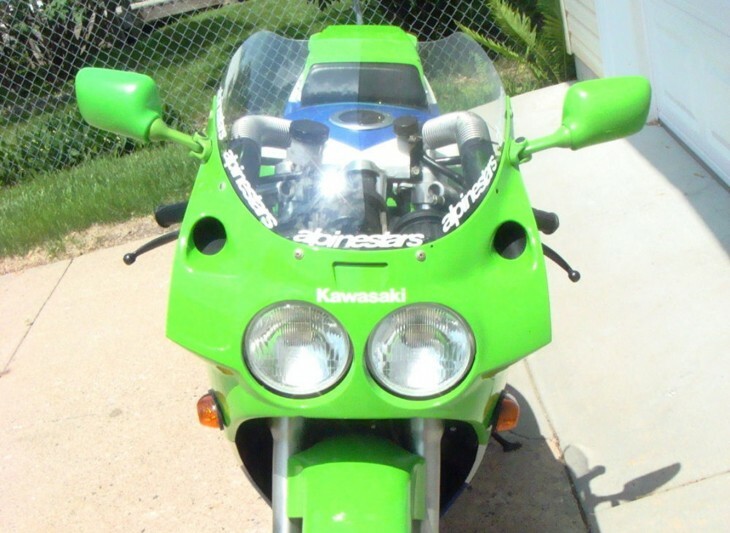 The ZX-7R sold in 1991 is generally known as the "J1," so what's going on here with what the seller claims is a "K1"? 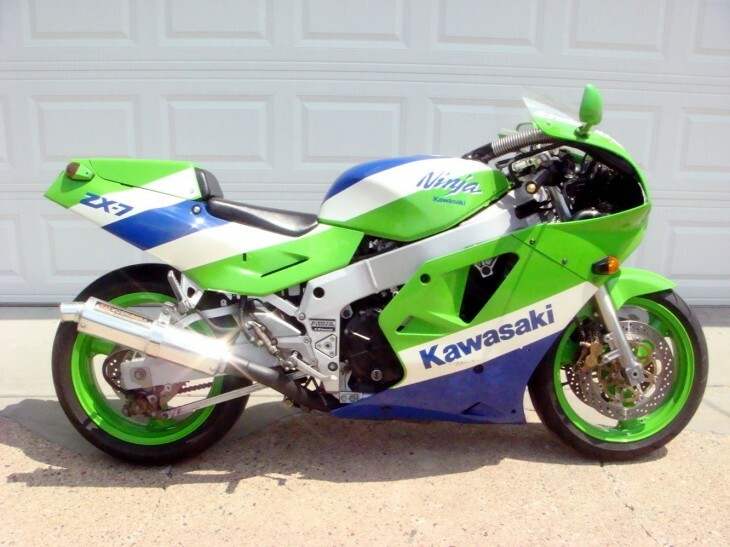 Although they provided a wide range of tuning parts for their ZX-7/ZXR-750 that allowed them to compete successfully, Kawasaki didn't really create an homologation special until the 1991 model year's ZX-7R K1. 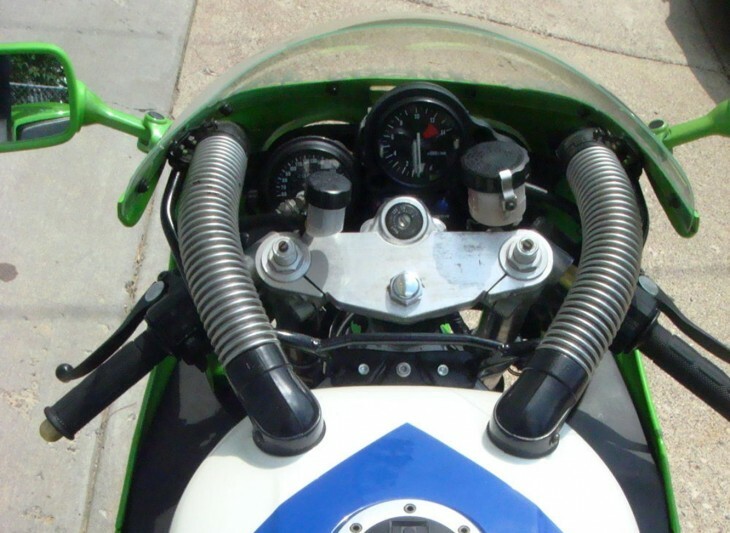 The K1's solo seat and aluminum tank meant it was was lighter, while flat-slide carbs and higher compression meant the engine made a bit more power and could rev a bit higher. Different ratios with a taller first gear were better for the track, but made stoplight getaways a clutch-slipping pain. Price was nearly double the stock bike, but worth it if you wanted to be competitive. Some of the most exotic motorcycles ever sold to the public were built during the 1990s, the golden era for homologation Superbikes. 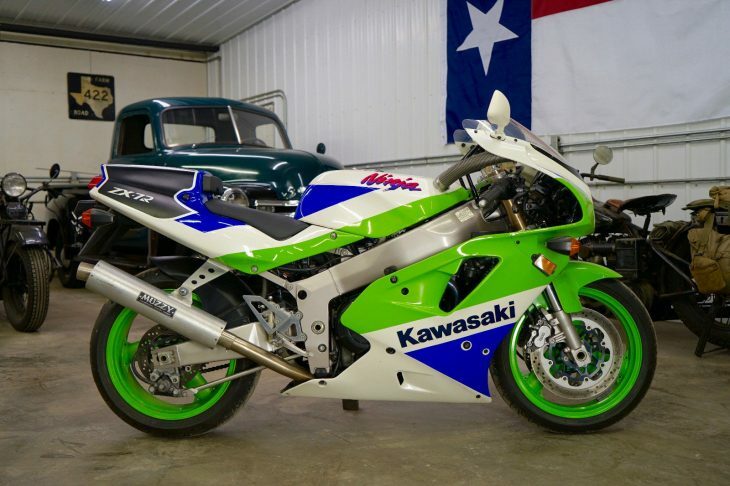 For sale is a rare and wonderful example of such a motorcycle - a limited edition 1991 Kawasaki ZX-7R K1 production-based race bike. 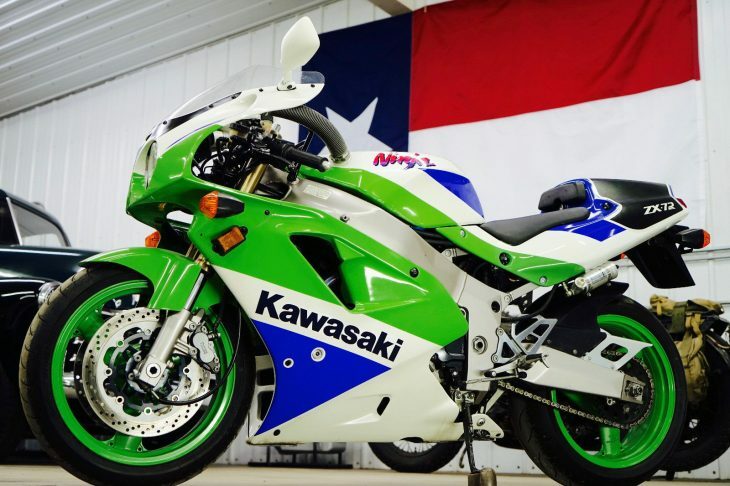 The Kawasaki Ninja ZX-7R K1 was a special limited edition of Kawi’s ZX-7R used in AMA Superbike. Kawasaki enjoyed tremendous success in competitive racing with this bike, and plenty of that tech made it to the ‘civilian’ version. 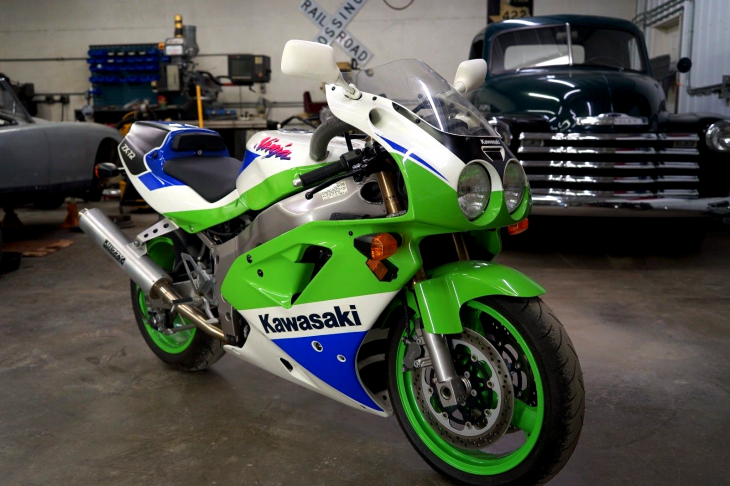 Required to produce 500 examples for homologation purposes, Kawi packed this bike full of features like 39mm Keihin flat-slide carbs, an aluminum gas tank, and a close ratio six speed transmission with an exceedingly tall first gear. All these goodies nearly doubled the MSRP compared to a base ZX-7R, but for the lucky 142 riders in the US who got to buy one, it was well worth it. 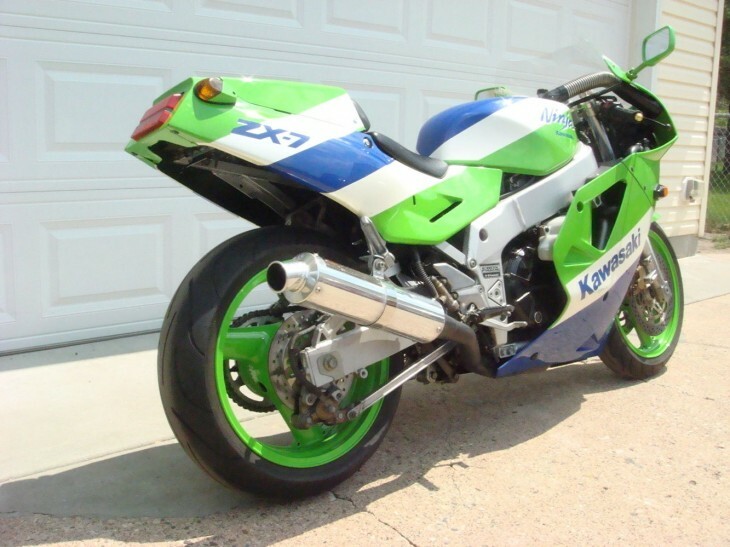 Weighing 10 pounds less than a base ZX-7R, the K1 had a tweaked engine with higher compression and a redline that was 500 rpm higher. This powerplant produced 120 horsepower at the crank, leading to a top speed of just under 160 miles per hour. (from the website bike-urious). This particular model has only 3,100 miles and starts, runs and rides beautifully...and sounds great with Muzzy exhaust. The upper fairing near the right side mirror has a couple small cracks (don't ask), but the bike is in remarkably nice shape overall and shows no sign of having been down. A new lithium battery is included, as well. Please Note: I’m listing this bike for a friend who has an exceptionally nice collection of motorcycles for sale, including other homologation bikes (Honda VFR750R RC30, Yamaha FZR750R OW01, numerous rare Ducati’s), a Vincent Black Shadow, an Ariel Square Four, two BSA Gold Stars, a 1937 UL Flathead Harley Davidson, etc. (additional photos included above). 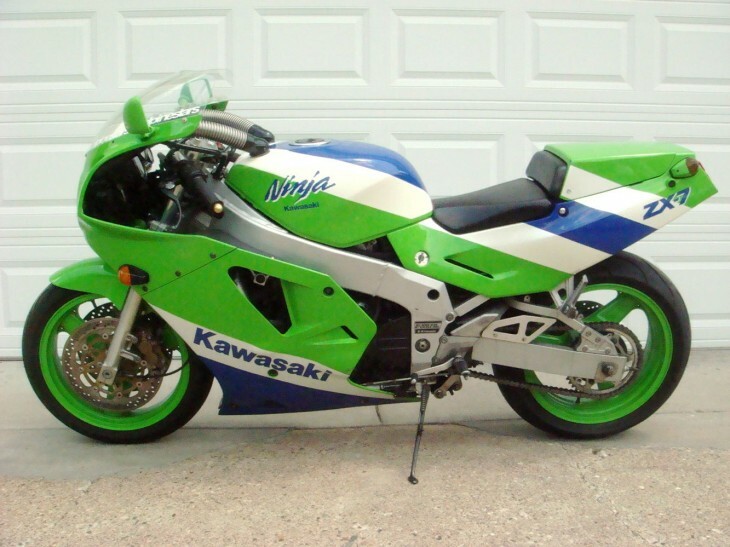 These are very rare and were extremely expensive when new, and there's been plenty of interest in sportbikes of the late 1980s and early 1990s recently. 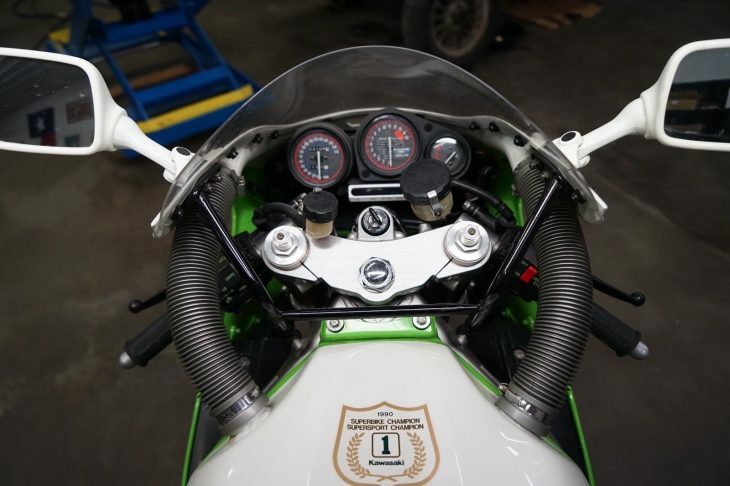 The starting bid for this ZX-7R K1 is $18,000 with no takers yet and several days left on the auction. The last one we featured sold for $14,500 back in 2015, so $18,000 seems like a fair price for this very clean, low-mileage example but maybe a bit high for a starting bid? 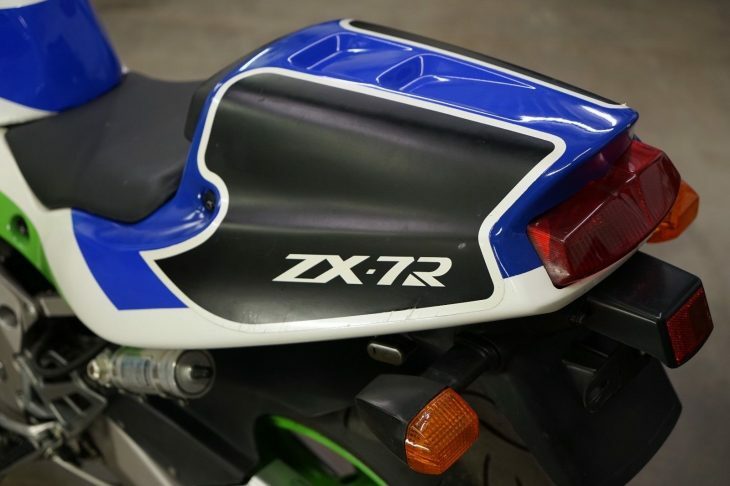 Although the ZXR-750/ZX-7 H1 often gets overlooked in favor of the GSX-R from the same time period, the Kawasaki was a worthy competitor. The bike was powered by a 749cc inline-four that produced 105hp, a number that looks unimpressive in light of today's sport bikes, but was on par with the Gixxer and YZF. Interestingly, while Honda sold their purpose-built RC30 race bike in extremely limited quantities, Suzuki built their dry-clutch "LE" Gixxers, and Yamaha built their exotic-under-the-skin OW01, Kawasaki offered no comparable homologation-special edition of the ZXR. Instead, they offered a whole range of race parts owners could use to compete at virtually every level of racing, an unusually grassroots approach. I purchased this bike to bring to motorcycle shows and take out to local bike nights as a fun classic Superbike. If your looking at this listing you are probably already aware how rare and hard to find these 89 ZX-7 H1's are. It's very hard to let this one go, but I've decided to sell this motorcycle and channel the funds into another motorcycle project. Very rare and collectable motorcycle. Nice condition cosmetically. Not perfect, but very clean for a 1989. Motorcycle runs and rides with no engine or transmission issues I can detect. Newer Michelin Pilot Power tires. Less than 2 years old with very few miles on them. Yoshimura exhaust that is period correct for the age of the bike. 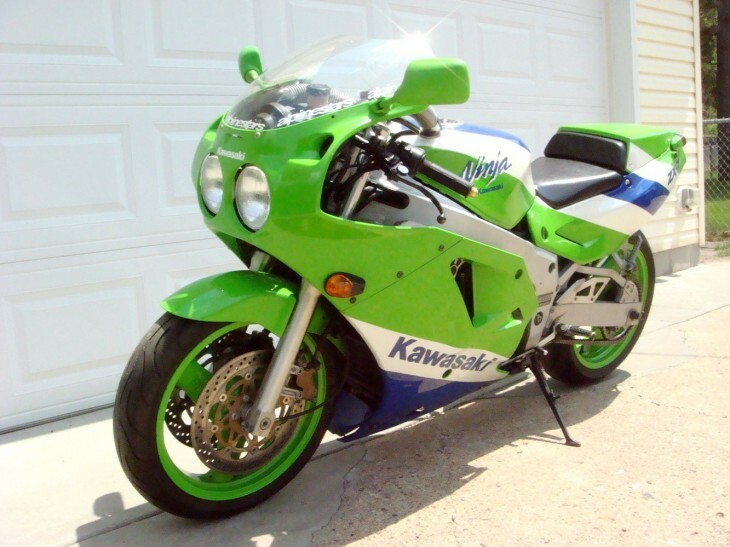 This is a motorcycle that is becoming very collectable as a superbike over 20 years old. It is a survivor in good condition. The motorcycle does have some minor marks, wear, and scratches. The bike starts, runs, and rides. I have not gone through the bike thoroughly to inspect all mechanics. There may be some service necessary. Listing bike as accurately as possible based on what I know. Aside from the "Alpinestars" decals and the questionably-located flush-mount signals, this is a very clean bike, and looks very original, just as the description indicates. These bikes were made to be ridden, and while it always seems a shame to spoil some pristine, low-mileage bike by actually using it, bikes like this one allow the owner to rack up the miles guilt-free, all the while enjoying the bike as Kawasaki intended. Not much time left on this listing, so move quickly if this strikes your fancy. The Buy It Now price of $5,500 it seems a bit on the high-side [pun! ], but not outrageously so. These are seemingly thin on the ground recently, and are often in pretty shabby condition when you can find them. 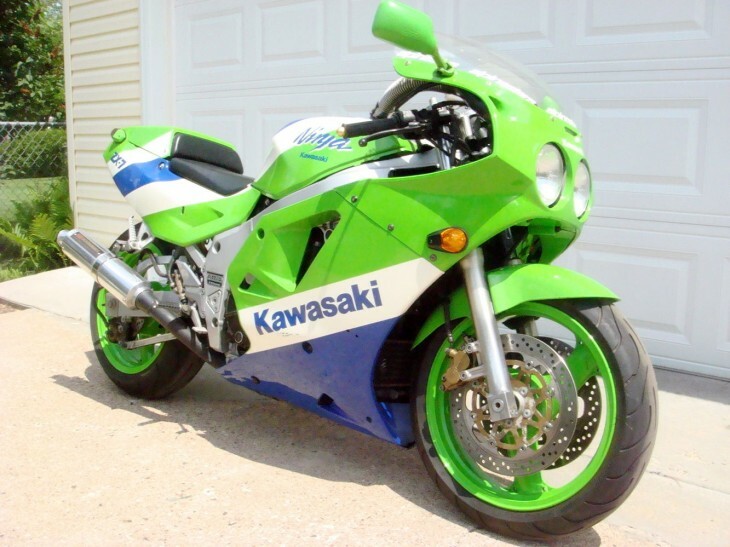 These have been increasing in value of late and, while they're hardly as rare as the Bimotas and Ducatis we often feature, Japanese sportbikes of this era have a very strong following among older riders who owned one new or wish they had, and young riders with a taste for lurid green paint jobs.